French President Emmanuel Macron held an emergency meeting with the prime minister and interior minister to discuss the riots and how to begin a dialogue with the protest movement, which has no real structure or leadership. French President Emmanuel Macron visited the graffiti-damaged Arc de Triomphe monument and held an emergency meeting on security on Sunday, a day after central Paris was hit by France’s worst riot in a generation. Macron, who was meeting with his prime minister and interior and environment ministers, has vowed that those responsible for the violence and the damages will pay for their actions. His tour of France’s beloved monument came just hours after he flew back from the G-20 summit in Argentina. Macron paid tribute to the Unknown Soldier from World War I whose tomb is under the monument. He then headed to a nearby avenue where activists wearing yellow jackets had torched cars, smashed windows, looted stores and battled police on Saturday. There he met with firefighters, police officers and restaurant owners. 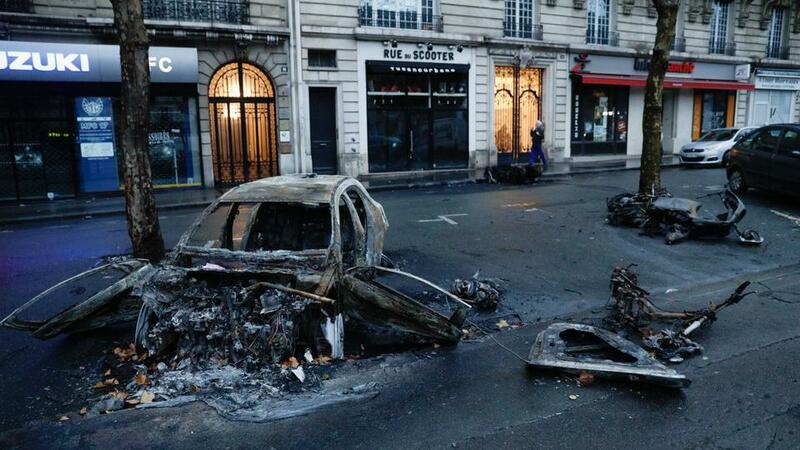 Earlier, a government spokesman Benjamin Griveaux said France would consider imposing a state of emergency to prevent a recurrence of some of the worst civil unrest in more than a decade and urged peaceful protesters to come to the negotiating table.